There's nothing that makes people go quite as weak at the knees other than a couple of weeks in the Maldives and if you've got plans to check out Asia's tiniest country then make sure you read the luxury hotel suggestions below to do it in style. White sands, swaying palms and the Indian Ocean, all you need now is a hammock and glass of fizz and you're all good to go. The setting: Indulge in pure paradise in the southernmost part of the Maldives, surrounded by crystal clear coral reefs, tropical nature trails, and exotic flora. The scene: The backdrop to this incredible resort is both dramatic and beautiful, from the 17,000 towering coconut palms, all the way to the topaz lagoons and sugary white sands. Ideal for families and couples alike, the tranquil ambience here will be sure to rejuvenate the soul. Six restaurants and bars offer a delectable mix of cuisines and cooking styles, whilst golf enthusiasts will love the nine-hole golf course. The stay: There are 132 private villas in total, offering phenomenal views of the beach or the luscious forest and all adopting a minimalist yet luxurious beach-hut vibe. The best bits: For the ultimate luxury, this lavish resort offers over water villas and treehouse villas, providing a unique stay that will take your breath away. The setting: Found in South Male Atoll, Velassaru can be reached only by luxury speedboat, whizzing across the turquoise Indian Ocean until the remote and private coral island comes into view. 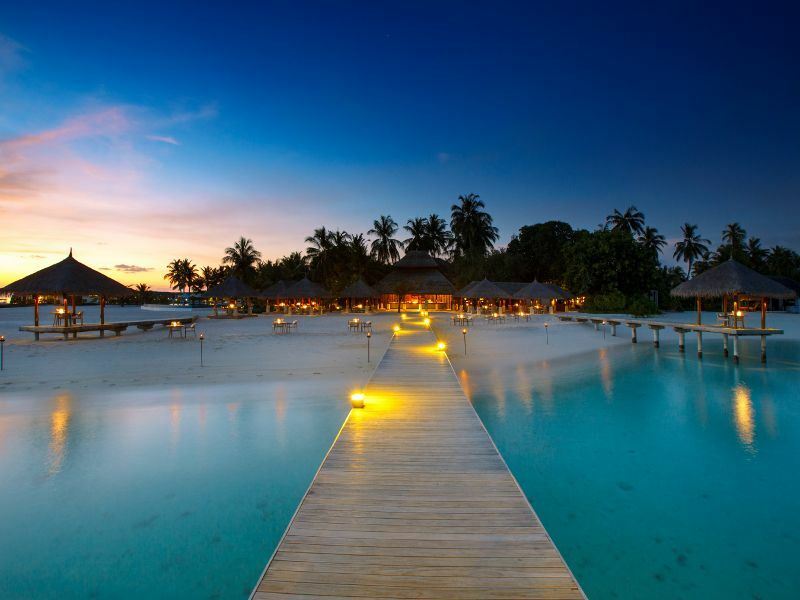 The scene: As you arrive at Velassaru, you’ll be taken aback by the beautiful scenes of pure white sand and the passionate staff that await with a chilled welcome drink. If you’re hoping for relaxation and seclusion, you’ve certainly come to the right place. Days here are slow and tranquil, spent treating yourself at The Spa, swimming in the gorgeous infinity pool, and dining on a delicious mix of Asian, Maldivian and Mediterranean cuisine. The stay: The villas and bungalows here evoke the authentic Maldivian sense of rustic-luxury, with thatched roofs, minimalist décor, and stunning views out of every window. 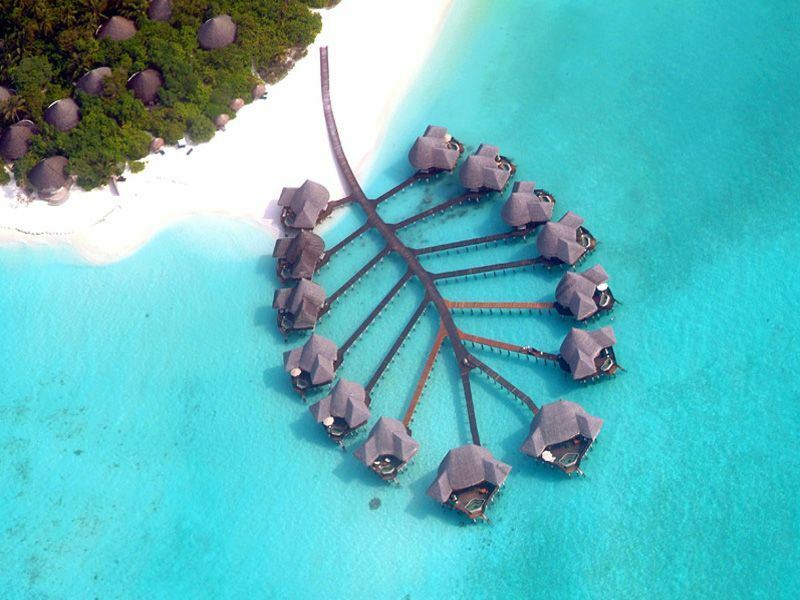 The Lagoon Water Bungalows are perched on stilts above the sparkling lagoon, ideal for those hoping for even more glamour. The best bits: We’re certain we can tempt you with the indulgent prospect of a private butler, catering to your every need as you dip into your oversized pool in the Water Suite. The setting: Nestled on the stunning island of Manafaru, this resort offers a beautiful blend of sparkling sea, tropical flora, and sugary white sands. The scene: Surrounded by towering palms and indigenous plants, JA Manafaru really hones in on the pleasure of relaxing in an exotic oasis. Every room features its own plunge pool, but you’ll also have three gorgeous main pools to choose from too – offering a great variety of spots to truly relax and soak up the sun. Beach front restaurants and bars are the perfect complement to a tropical getaway, whilst the wine ‘cave’ with its vintage wines is ideal for a unique evening to remember. 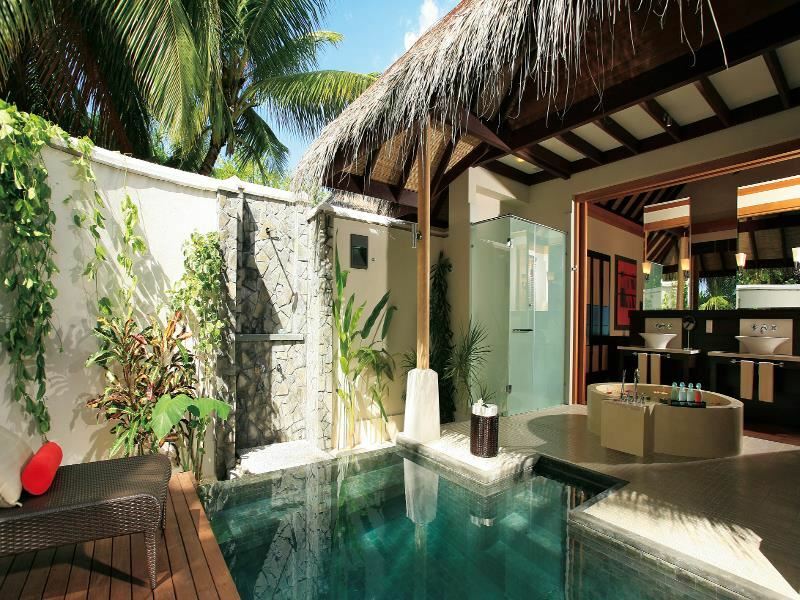 The stay: There are 84 bungalows and villas altogether, all perched along the powdery sands and offering stunning views. The water villas with infinity pool are perfect for a wonderfully romantic honeymoon – you’ll just need to choose whether you’d prefer a dramatic sunset view, or an idyllic sunrise view. The best bits: The rejuvenating spa paints JA Manafaru as one of Maldives’ most tranquil resorts. The setting: Neatly sandwiched in between Male and the equator. The scene: Yoga sessions, cooking lessons or days spent under water are all highly recommended on this private island paradise and if you've got any time left over then a trip to the spa will no doubt send you swirling into pampered VIP heaven. If you're into exploring then a cheeky boat ride will take you across the ocean in search of dolphins, sun sets and the equator – all aboard! 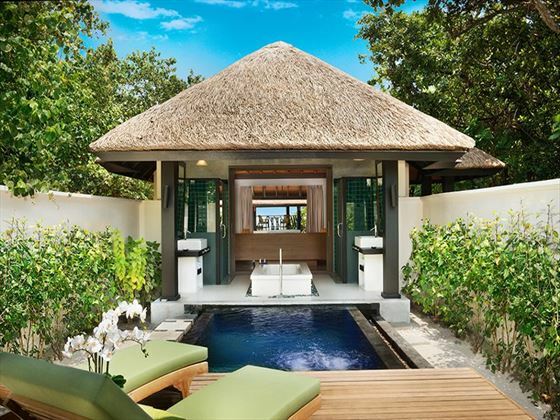 The stay: 50 villas offering the very best in 5-star accommodation including: plunge pools, designer furniture and the very best in natural light and magnificent ocean views. The best bits: The villas that are located over the ocean have got to be seen to be believed. 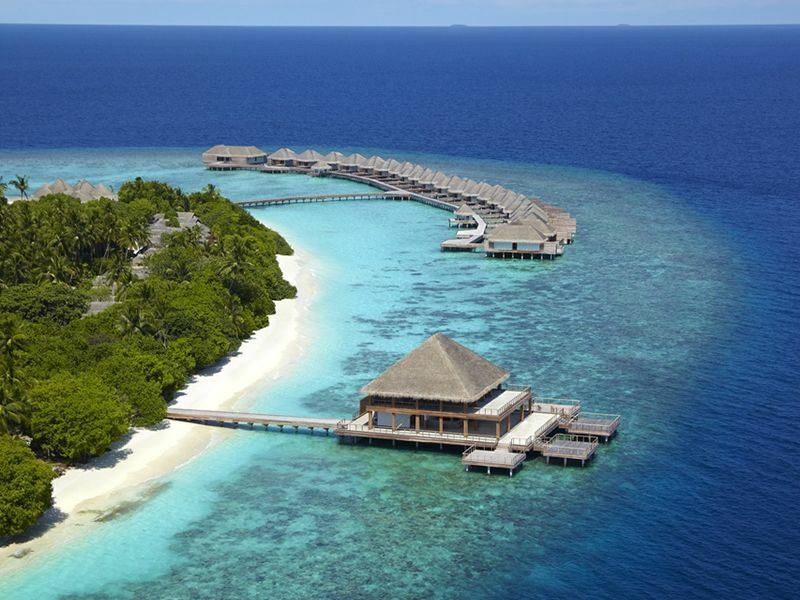 The setting: Located to the southwest of Male as the penultimate southernmost island in the Maldives. The scene: An enchanting array of tropical gardens and lush green vegetation makes Lily Beach Resort a spectacular fusion of colour with those all-important ocean hues adding to a fabulous picture of health and happiness. Lots of things to do for the whole family, including: kids' clubs, beach activities, watersports and evening entertainment. If you manage to get any 'me time' then you could do worse than an afternoon or even a couple of hours spent at Tamara Spa. 2 freshwater swimming pools, a couple of restaurants and banana boat rides – job done! The stay: Almost 120 air-conditioned guest villas featuring everything from Jacuzzis to four-poster king-size beds. The best bits: Excellent facilities and services for the kids make this an awesome option for tropical island loving families. The setting: Just under half an hour's speedboat ride from Male. 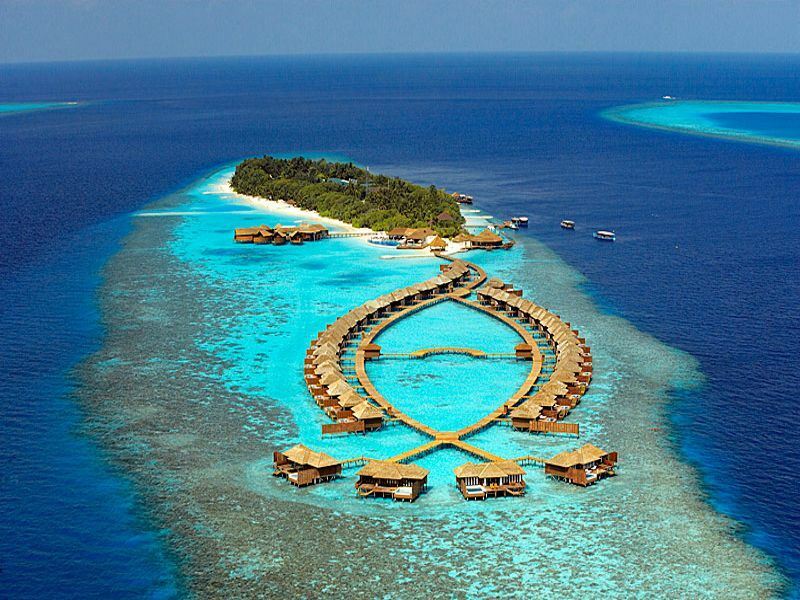 The scene: This wonderful hotel is renowned for its watersports and dedication to the marine life of the Indian Ocean. Catamaran sailing, sunset cruises and Scuba diving all enable you to get closer to the water and you can always use your private pool if you fancy a fresh water alternative. 3 great restaurants, a spa and superb accommodation more than compliment the gorgeous sea views. The stay: Around 90 villas set within tropical gardens or on the beachfront with teak flooring, stand alone tubs and plenty of space. The best bits: Why not indulge in a spot of sandbank dining for the ultimate in romantic moonlit suppers. The setting: Situated quite a way to the southwest of Male straddling a couple of islands via a bridge. The scene: This is pretty much the epitome of luxury accommodation in the Maldives and if you're looking for an award-winning tropical retreat then Conrad hotel on Rangali Island is where your search stops. 7 world-class restaurants, including an underwater location, form the gourmet backbone to your stay with the surrounding ocean views providing an idyllic accompaniment. Watersports, fitness centres, a swimming pool and plenty of kid-friendly options (ice cream spa anyone? ), give you lots more food for thought however, an evening spent watching the sun set is always going to be a natural daily highlight. The stay: A fabulous choice of suites and villas have been designed to maximise the sunshine and sea views with Rangali Island reserved just for adults to get a bit of peace and quiet. 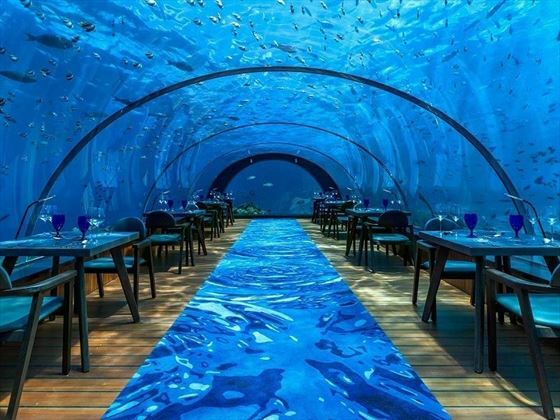 The best bits: Underwater fine-dining at Ithaa is always going to tip the balance when it comes to unique and unforgettable experiences. The setting: Just half an hour north of Male (by seaplane) and plenty more miles directly west of the southern tip of Sri Lanka. The scene: Peace and tranquility with lots of salt-encrusted wooden decking provides just a taste of things to come with a couple of restaurants and beach bars thrown in for good measure. If you're feeling in the mood for some fun and games you'll find tennis, volleyball and badminton courts available although, it would be rude not to get your toes wet and the watersports and spa options are plentiful. The stay: Garden or private veranda settings help you make the most of the calming ocean hues, especially around sun set. Air-con, en-suite and tea/coffee making facilities – surely, nothing else is required? The best bits: The open cooking station in the Cowrie Restaurant is a sight for sore eyes in more ways than one. 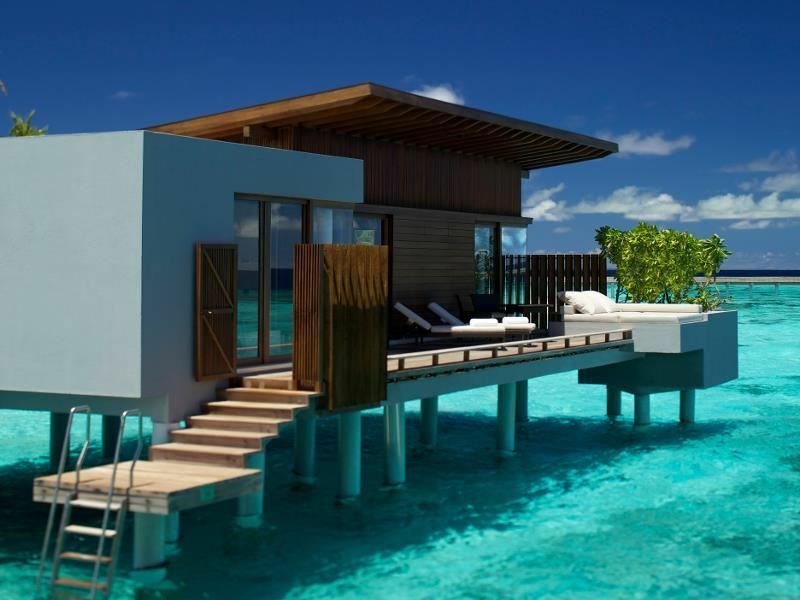 The setting: Based on one of the largest islands in the Maldives, Dhidhoofinolhu, within the stunning South Ari Atol. The scene: Loads of activities and things to do will tempt you from a day spent in your hammock although, after a couple of tropical cocktails, there's probably nothing more appropriate. 2 infinity pools, kids' and teens' clubs and a spa with no less than 15 treatment rooms, if you're still looking for more options then you probably need to amend your desert island expectations. The stay: Just shy of 200 guest rooms and suites all of which feature: air-con, WiFi access and plenty of privacy. The best bits: Aside from the spa, watersports and dining facilities there are lots of secret honesty bars, free phone home boxes and messages in bottles to keep your Robinson Crusoe levels fixed on excited. The setting: This luxurious hotel is nestled on a beautiful, private coral island in the Lhaviyani Atoll, and is the only resort there. Arrive via a 40-minute seaplane from Velana International Airport. The scene: Perched on its own secluded island, this is intimacy and privacy at its finest, offering barefoot luxury that is incredibly enticing. The ambience is very tranquil thanks to its secluded location, leaving you to truly unwind and make the most of the phenomenal views and vibrant reef. The stay: Each villa is a little slice of paradise thanks to the stunning sunrise or sunset views. Stay in one of the lavish Beach Villas or Beach Pool Villas and you’ll only be steps away from the wonderfully warm white sands, or truly indulge with an Ocean Pool Villa – perched over the water, you’ll have access to the stunning crystal-clear lagoon. 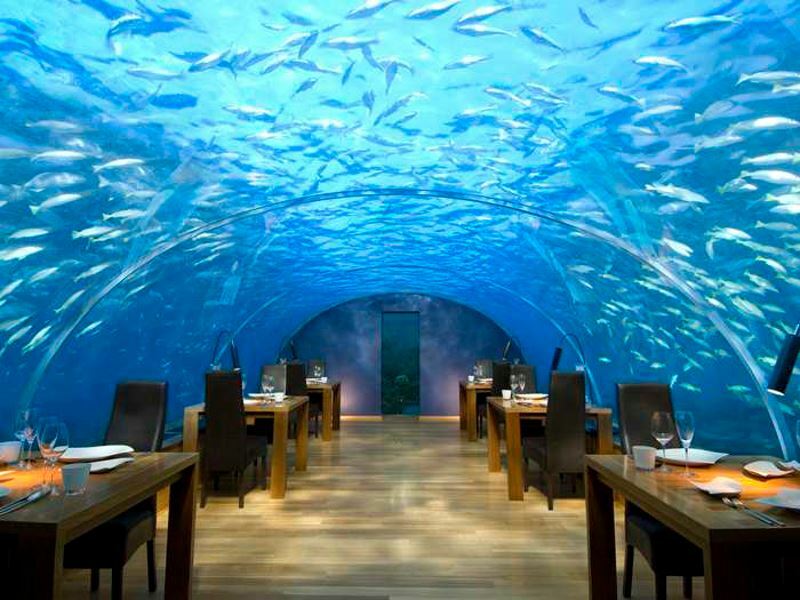 The best bits: The remarkable 5.8 Undersea Restaurant is not to be missed – it’s a dining experience like no other. Who could resist dining on decadent, world-class tasting menus 5.8 metres underwater? The view of the reef and its tropical marine life is incredible.